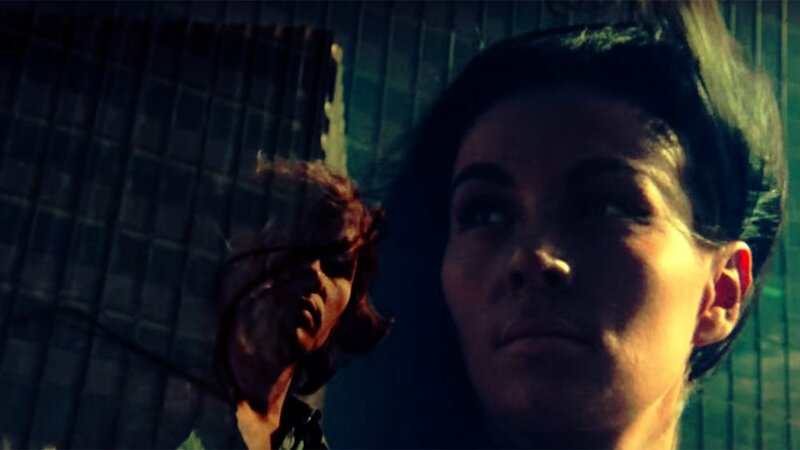 The long chaotic journey for The Other Side of the Wind, going from elusive lost film to freely available on Netflix, feels as if it were all meticulously and deliberately orchestrated by its creator Orson Welles, even posthumously. Such nudge-wink metatextuality here is actually astonishingly prophetic, as the filmmaker main character himself is struggling with the finances and other means of completing his new project. 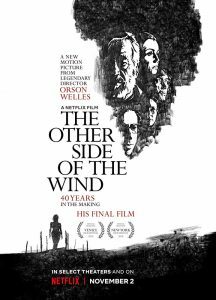 How Welles knew this film would itself succumb to a similar fate to the film within the film (also called ‘The Other Side of the Wind’, to add to the confusing self-awareness) is yet another enigma under his genius. He must’ve always known that he wouldn’t complete the film, have it stowed away for years after his death, then have it eventually unearthed, finally assembled, and freely broadcast to the world through what would be known as an online streaming service – he must’ve known all along! As curious as its production is, this odd film and its pieced-together piecemeal nature is perfectly suited for a service like Netflix, where you don’t have to take the film in its entirety, but drop in and out at whichever point you please – you’re bound to land on some sly sardonic humour that’s permeated with the stench of cigar smoke and whiskey. Both the writing and editing contain a wild spirit that’s reflective of the haphazard production, all without an overall semblance and are pieced together almost in a stream-of-consciousness fashion that Welles was able to uphold and keep consistency with throughout the six years he filmed for. Amidst a fairly large ensemble, the film focuses on Welles’ surrogate, the filmmaker Jake Hannaford, in this one-night bottle film taking place at Hannaford’s 70th birthday party at his lavish estate (as well as his last day alive). Trying to direct the chaos of all the critics and journalists and fellow filmmakers and producers is his protégé, Brooks, who looks up to him as a troubled and inspiring drunken father and who Hannaford looks down on as what he says is his link to a younger generation. Hannaford and Brooks are both played by real-life film directors, John Huston and Peter Bogdanovich respectively, who may be playing themselves, but they act themselves well. Their generation disparity shows a difference in character, with Hannaford’s cigar-chomping, whiskey guzzling, self-assured mentality, along with the slightly more nervous and less experienced Brooks. All these proto-mockumentary moments are broken up at times by the film within the film that Hannaford is screening in its rough cut stage, which shows in full colour and widescreen a dialogue-less, groovy, hypnotic, analogical, yet seemingly misguidedly meaningless piece of work that acts like a Zabriskie Point parody. As a funky experimental film, it keeps our attention during its presence in the film, yet as an actual film on its own, its appropriately empty and too ambiguously vague, which is suitable as it adds to the filmmaker character’s creative hesitance. In the quite brilliant accompanying documentary They’ll Love Me When I’m Dead, Welles half-jokes about the project, claiming the reason for The Other Side of the Wind’s existence is its non-existence, is that its intention is to remain a never-finished and never-screen film, lost forever to the public. Welles has been elusive about film non-projects before – when Bogdanovich told him the title to his ‘Addie Pray’ adaptation, Paper Moon, Welles replied “that title is so good, you shouldn’t even make the picture, just release the title”. Along with this documentary, Netflix users should also check out A Final Cut for Orson: 40 Years in the Making (found among The Other side of the Wind’s ‘trailers and more’ section on Netflix), which is a 40 minute documentary getting into the nitty-gritty finer details of the film’s unearthing, transcoding, remastering, and finally assembly, a perfect watch for film geeks. But at the centre of this whole triumphant miraculous story for the cinema ages is the film itself. It may be ridiculously self-conscious about its own destiny, but watched within (or without) any context, The Other side of the Wind must been seen by any enthusiasts of cinema history, as it acted as a document of the passing of Classic Hollywood and the emergence of New Hollywood. But perhaps most importantly than any other aspect, it’s a joyously entertaining and hilarious watch that proves Welles always had a rambunctious sense of humour. 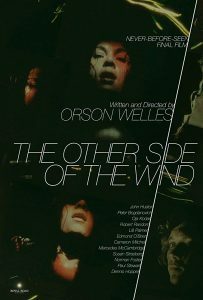 Peter Bogdanovich, John Huston in Orson Wells' "The Other Side Of The Wind"